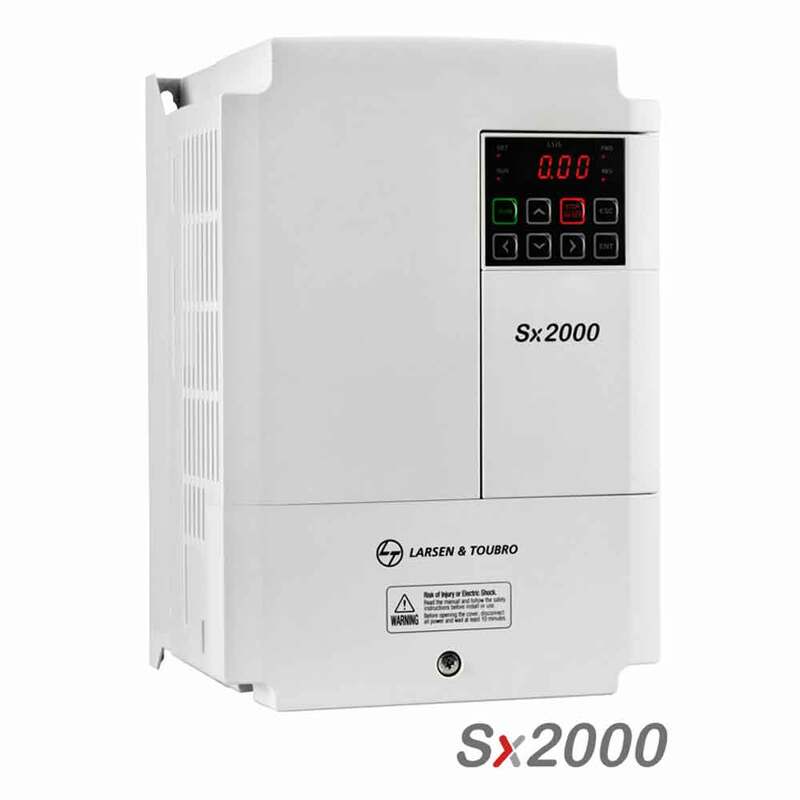 The Sx2000 adds a new dimension to L&T's AC drive solutions. 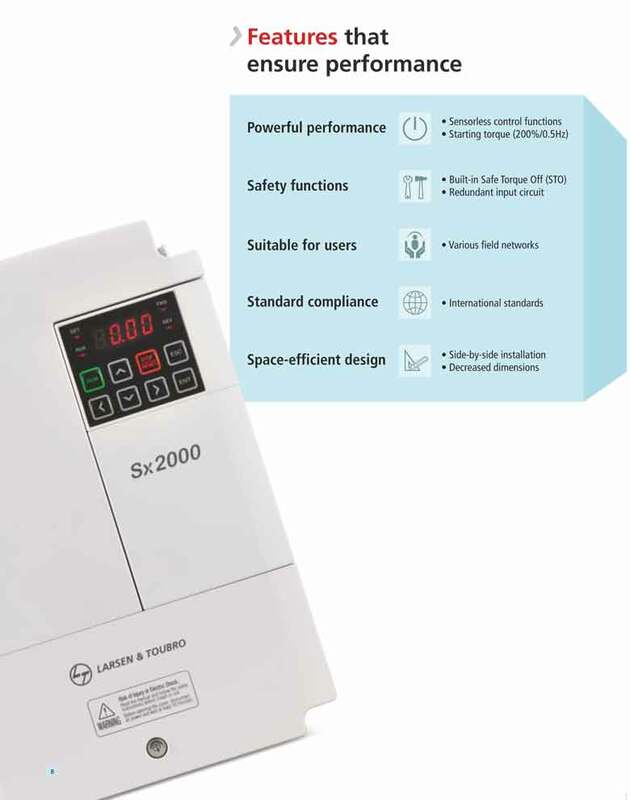 Built to L&T's stringent quality standards, the Sx2000 is tested and certified to meet global benchmarks, thus giving you the assurance of total reliability. 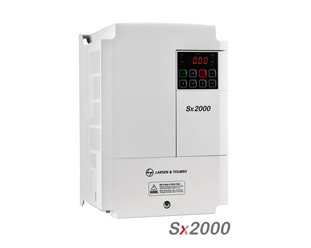 The Sx2000 is built to deliver powerful performance. It handles loads up to 75 kW (HD) / 90 kW (ND) – making it perfect for compressors, conveyors, machine tools, elevators, textiles, fans, pumps, plastic extruders, wire drawings, etc. Parameters can be copied/loaded from the drive to the smart copier and vice versa – simply with the keypad. It produces a starting torque of 200% at 0.5 Hz, which provides better control at low-speed. 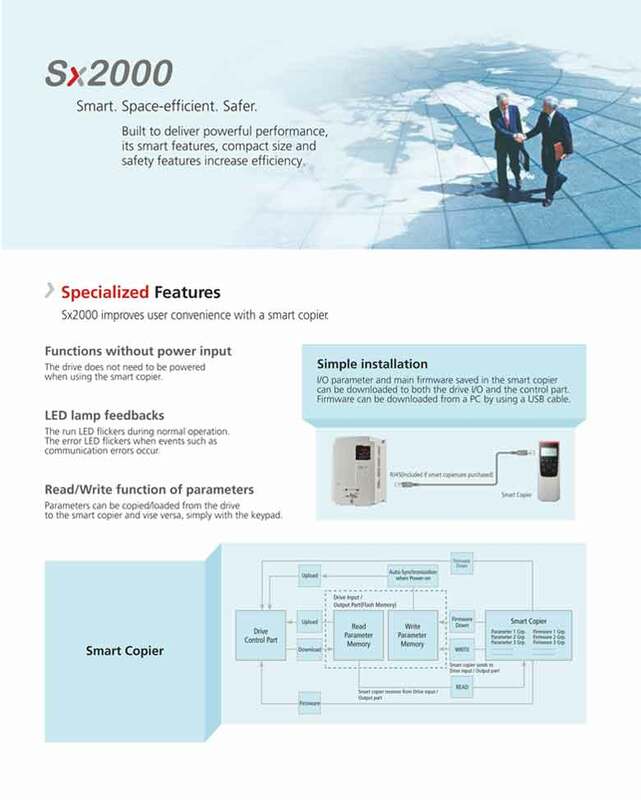 Its compact size enables panel-size reduction, hence helps in space-efficient design. It has safety features like Safe Torque Off (STO) with redundant input circuit which meet EN 61508 SIL 2 standards. V/F, Sensorless Vector Control, Slip compensation. Starting Torque: 150% at 3 Hz for V/F, 200% at 0.5Hz for Vector Control. Peer to Peer Communication to share I/O’s. Brake opening command by Drive under following condition Inverter Output Frequency > Brake Release Frequency AND Inverter Output Current > Brake Release Current . Brake Close frequency different settings possible for Hoisting & Lowering Motion. Peer to peer communication among the drives allows sharing any I/O via inbuilt RS485 communication. It might be useful in case of limited number of I/O points for a certain system. No Software required to create logic. Function blocks: AND, NOR, ADD, SUB, MIN, MAX, COMPARE, TIMER, XOR, SWITCH, UP/DWN COUNT...etc. Easy download of Customized firmware from copy unit to drive. Modbus TCP / Ethernet I/P).